A multi-functional and practical Eleven Table By Calligaris is suitable for a wide variety of décors. A button on the side releases the lock and helps the table raise up from 16.6" to 29.25". 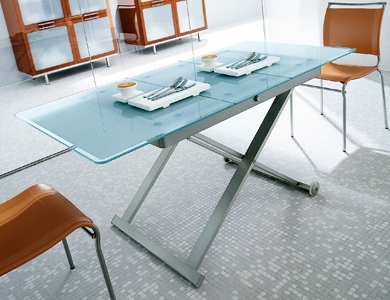 The middle stored glass leaf extends the table in length from 43.9" to 59". Made in Italy. Table height adjusts from 16.6" to 29.25"